The CLR-Series current loop receiving relays are designed to receive KYZ pulse information from the PTR-1PS Pulse Transmitting Relay over a twisted pair current loop. Since the CLR Series is powered by and operated from the PTR-1PS’s current loop output, it needs no separate power supply. The CLR Series is available with one to three outputs. 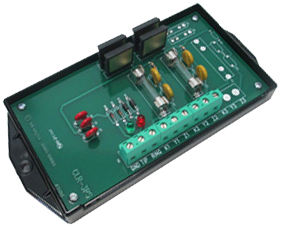 Each output is an isolated solid-state Form C (K, Y, & Z) relay contact. Applications include long distance pulse transmission interfaces up to 2-4 miles between utility metering devices and customer-owned energy control systems, demand recorders, or supervisory control (SCADA) systems. The CLR Series relays contain high light output red and green LED indicators that display the system’s status at all times thus allowing a rapid check of the metering system’s pulse pick-up and relay’s performance without requiring any additional test equipment. 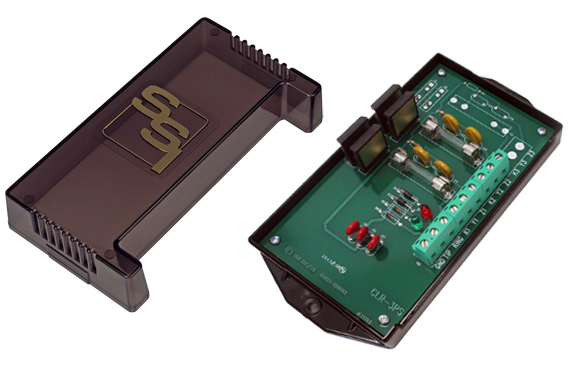 The CLR Series’ input and output circuit’s terminal strip is a “Euro” type connector. When the stripped wire has been correctly installed in the terminal’s slot, no conductive parts are exposed on the surface of the terminal strip. Due to the inherent current-limited nature of the design, no fusing is necessary on the input. No damage will result if the current loop is shorted. The “K” lead of each of the CLR relay’s outputs is fused to prevent damage to the relay under almost any conditions a user might encounter such as excessive current, incorrect wiring, etc. The CLR’s output relays have built-in MOV transient protection for the solid-state relay contacts. Transient suppression for the current loop is provided by metal-oxide varistors (MOV’s) between the current loop input terminals and ground. This eliminates the need for external or off-the-board transient suppressors. All component parts which have voltage applied to them, with the exception of the input-output terminal strip, are enclosed in a polycarbonate cover for maximum user protection. The mounting base plate is also made of polycarbonate and offers excellent electrical insulation between the circuit and the mounting surface. The CLR series relays are designed to mount inside another enclosure, suitable for the user’s intended application.